Lin Tianzhuan and Dede Kosawa have a lot in common. Aside from both being from the Asian continent, both men are famous for having some pretty distinctive medical conditions. Dede Kosawa is the Tree Man of Java, whose multiple surgeries to remove bark-like growths have captivated the world. 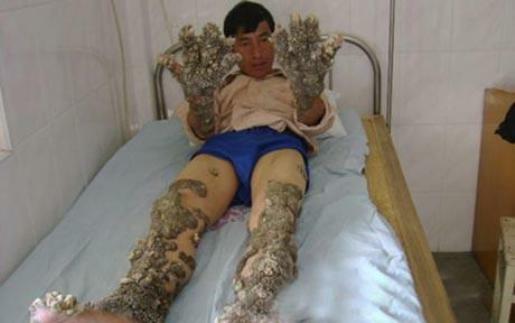 Lin Tianzhuan is better known as Coral Boy or the Shell Man of China, who recently underwent surgery to remove debilitating shell-like growths from his entire body. Hopefully that’s all the two men will have in common. Unfortunately for Dede, his warts eventually grew back. I’d hate to see that happen to someone else. The saddest part of Kosawa’s story is that he had a brief taste of a normal life, only to have it taken away from him again. However, if I had to guess? Coral Boy’s shells remind me way too much of the Tree Man’s bark. Odds are it’s going to grow back, even though doctors say Lin should be able to live a normal life. For Lin’s sake, I hope I’m wrong and the medical professionals are right.